There comes a point at which you can no longer say, “I had a bumper choice of themes to choose from this month.” There comes a point a which a huge number of candidates comes to be the norm. That seems to now be the case. 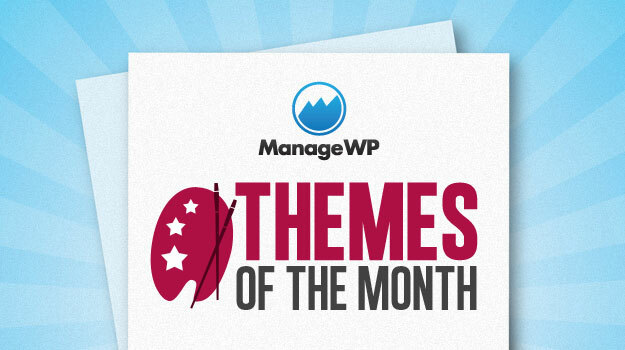 So instead I can say to you that I had an average number of themes to choose from this month. While that may not sound quite as exciting, the fact that awesome themes now seem to be the norm is pretty awesome in my opinion. Enjoy! The folks over at Automattic have been busy — this is the first of two of their themes featured this month and I actually had no less than four to choose from. 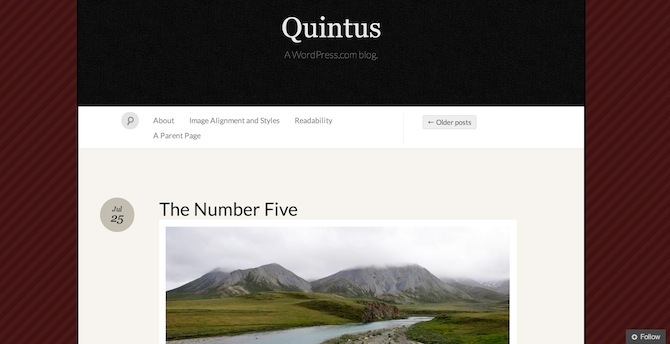 Quintus offers a simple yet striking one-column design with “semi-academic graciousness and elegant typography” (at least, that’s what I read). It would be a great option for anyone with a personal blog, especially if you like to publish photos. This is the highest-rated theme in this month’s list with an impressive 12 five star ratings at the time of writing. 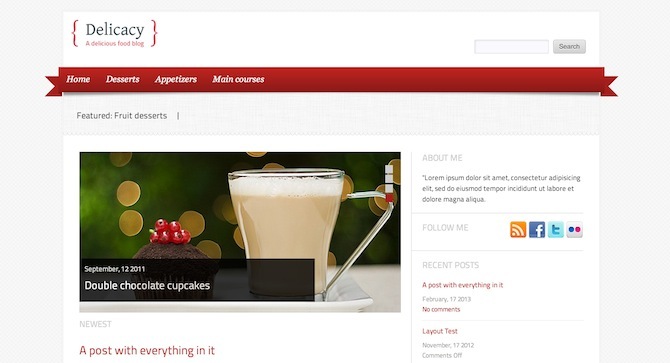 It’s clear to see why too — Delicacy is a clean and well-presented theme for food bloggers. Having said that, the developer claims that it can easily be adapted for other uses. There’s something I really love about Automattic’s second featured theme this month but I can’t quite put my finger on it. It’s probably the extremely simple yet striking design with bold typography and ease of navigation. 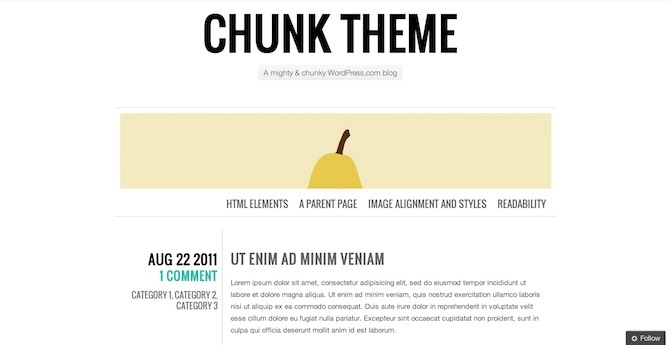 There’s a lot to like about keeping it simple and Chunk is an excellent example of that fact. ThemeZee pop up on a pretty regular basis with good-looking themes and zeeNews is no exception. I’m sure that you can guess about the intended application for this theme and it doesn’t disappoint with extensive theme options, custom menus, custom widgets, custom page templates and more. That’s a whole lot of custom. Finally we have this rather attractive theme which makes full use of your monitor’s available space. The three column layout allows for the traditional content + sidebar combo but you also get a natty post meta box to the left of the content. Infosource is clean and attractive and would be a fine option for any number of bloggers. Next blogpost:Announcing the Launch of the ManageWP T-Shirt Store! Are these Themes responsive? If they are not, they are not useful anymore. Nice and clean designs. Like it. Have browsed several other sites and this one has by far the best suggestions. 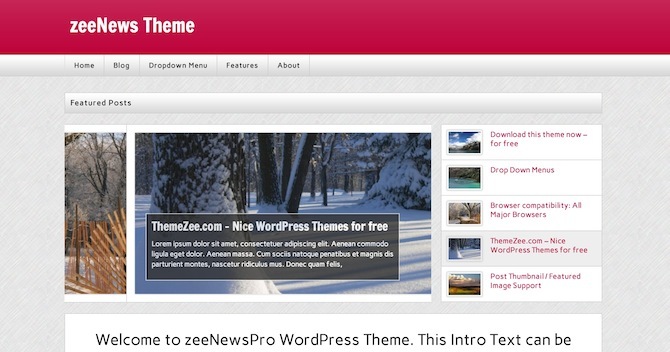 great selection of wp themes. will definately use some of your suggestions on my sites. grest job! 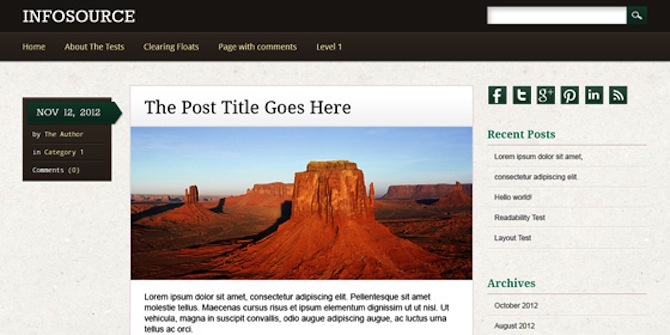 Very nice WordPress Template Collection.Thanks! Nice collection. Infosource looks nice, maybe I’ll try it. I’d say #3’s my fav. I don’t know why John is saying responsive design is not worth it. Everyone is moving to mobile. I’m gonna experiment with the top two on one of my niche sites :-).